Over recent years, there has been increasing awareness that local knowledge and practices should be recognised in developing initiatives aimed at sustaining and improving the livelihoods of farming communities and the environment. Interest amongst research, education and development institutions to investigate and document local knowledge has grown significantly over the last few years. Bangor University is a leading institution in the development of a knowledge-based systems methodology to acquire and use local knowledge in research and development. The AKT5 system is primarily concerned with gathering local ecological knowledge (LEK). Local ecological knowledge refers to what people know about their natural environment, based primarily on their own experience and observation. Where management has a large impact on the natural resource base, it is useful to refer to it as agro-ecological knowledge, to emphasise the management component. For more information on AKT5 and local ecological knowledge please see background. 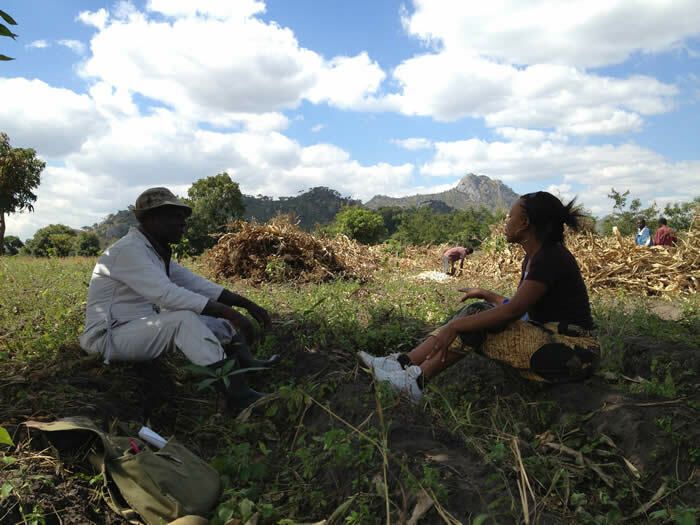 Interviewing farmers in Malawi, 2013, Ghana, 2008 and Lesotho, 2003.